The site, in Rone parish, was investigated last Thursday (April 5) on the final day of a county-wide archaeological survey of sites thought to be threatened by looters. After receiving strong signals from a metal detector, Museum of Gotland archaeologists found a bronze barrel filled with silver coins about a foot below the surface of the soil. 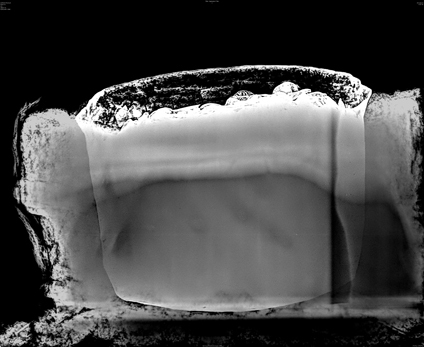 To preserve the artefacts the barrel was lifted with soil still packed around it, contained in a plaster cast, and sent to Visby to be x-rayed. One of the coins has been cleaned and examined so far, and was found to have been minted in Cologne in the first half of the 11th century AD. Although the rest of the have yet to be analysed, archaeologist Per Widerström told Swedish newspaper The Local that they were likely to number into the thousands. Research on the contents of the hoard is still ongoing, and Gotland Museum archaeologists are also examining the field where it was discovered to see if there are any signs of a nearby settlement. Watch out for our article covering this discovery in greater depth in the next issue of CWA (#53).